High quality rabbit fur leather bomber / aviator pilot hats. These premium quality leather trapper hats are made of natural rabbit fur and natural leather. Thick, warm and very stylish! The earflaps can be snapped behind neck or on top of the hat also. Adjusting strap with velcro has light-reflecting elements. 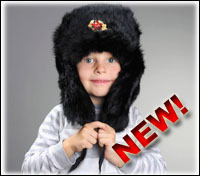 The hats are very comfortable and great for skiing, snowboarding or any other winter outdoor activities!